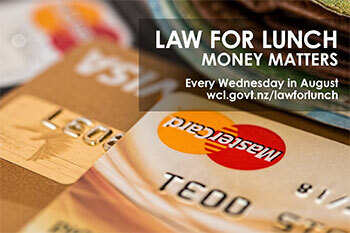 Come along to a seminar on Wednesday 16 August on the topic of credit and debt. Get the benefit of accurate legal information and practical advice and have the opportunity to ask your questions. Worried you can’t keep up with your debts? Would like to discuss your case with an expert? Our speakers, Kathryn Webb, from the Commerce Commission and Tim Barnett, from National Building Financial Capacity Charitable Trust, will explain what to look out for when signing credit contracts and what to do if your debts are getting out of control. All welcome! Refreshments will be offered.